Although the weather may be acting different, the calendar is telling me summer is here. 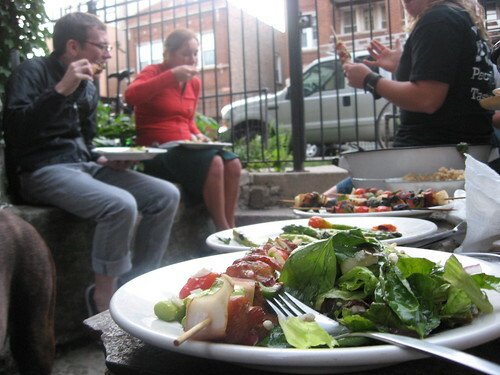 There’s nothing we Chicagoans want more right now then a good backyard BBQ. “My apartment building in the city doesn’t have a yard” I can hear you lamenting. Don’t worry, mine doesn’t either. Last year, we made do with hanging out in the gangway stairwell. This worked OK and we had lots of fun, but this year, OK isn’t good enough. We’ve been trying to think up a remedy to our urban problem with no luck until recently. Ever since one of local bars closed, the loyal patrons, refusing to frequent the bar across the street, have been hanging out on the sidewalk outside the locked doors with unmarked glasses of unmarked liquids. 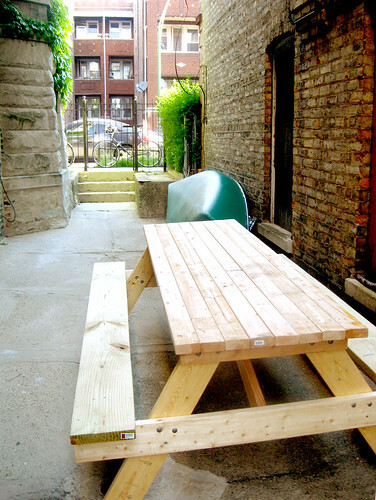 The other day, I found the drinking club had seriously upgraded their sidewalk saloon with a new picnic table, taking them from wino to winner with just 20 pieces of wood. There’s more then juice in the juice and coffee cup is not holding coffee. I love these guys! 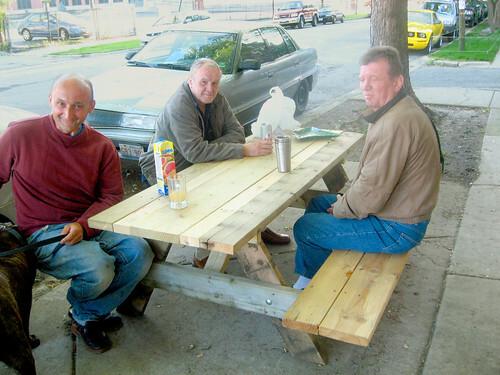 They just plopped this their table on the side of a city street, and got right down to business. 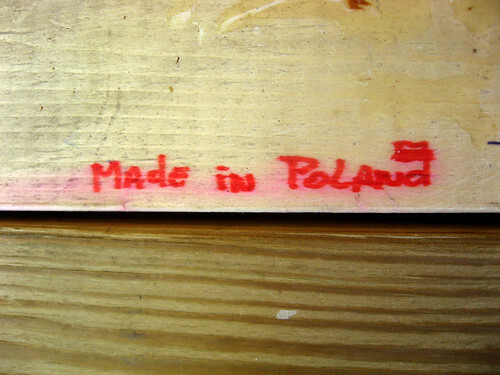 If you ask about the table, they will proudly display the “made in Poland” scrawled on the tabletop to prove it’s their own handycraft. “Is easy to make. I make you one too” the bearded one (not pictured above) says as he winks at me. This got me thinking. Is this the answer to our yardless BBQ problem? I casually suggested to Ira and our neighbor Eric that they postpone assembling the “slop heap” compost pile they’ve been obsessing about, and take a cue from the Polish Drinking club. I want to be rockin’ it on street level! Eric’s got the pencil ready (left) as they discuss their next move. 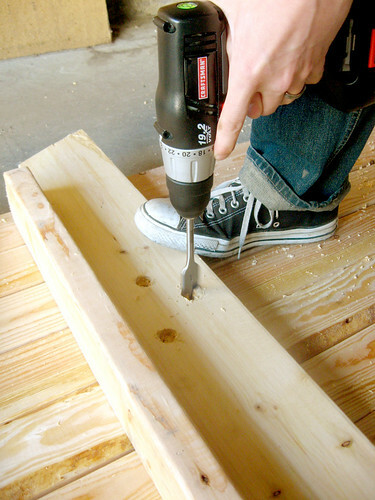 Ira drilling holes for the hardware (right). 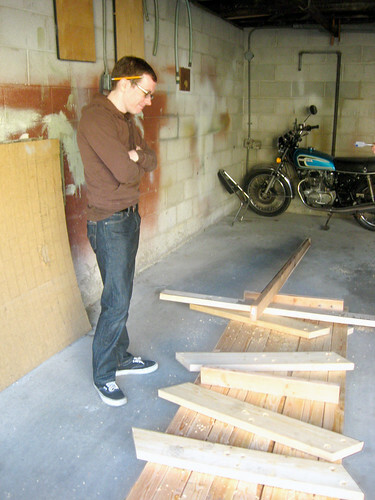 For the past week, Ira and Eric have been busy as bees in the garage we rent down the block constructing a table from blue prints they got off the internet. Men being men! Last night, they lugged this thing down the alley and seated it in its new place of honor! Pull out the beer and meat; summer BBQ here we come! too amazing! you guys should go steal our city approved (i.e. rat proof) compost bin from our old backyard. no lawn needed! If you are looking for recommendations on the composter, try the Creative-Circuit Base Compost Tumbler. I have one of these (I think the brand name has changed since). It takes up almost no space, is easy to use, no maintenance, locks up real tight, and if mixed properly is no mess or odor(can be placed on a porch, deck, or concrete slab). And nice table. Gotta love those Polish carpenters. Really nice Ira and Eric! !